Unlike a chemical reaction, which depends strongly on the temperature (through the Arrhenius equation), an electrochemical reaction depends directly on the applied potential at the electrodes. 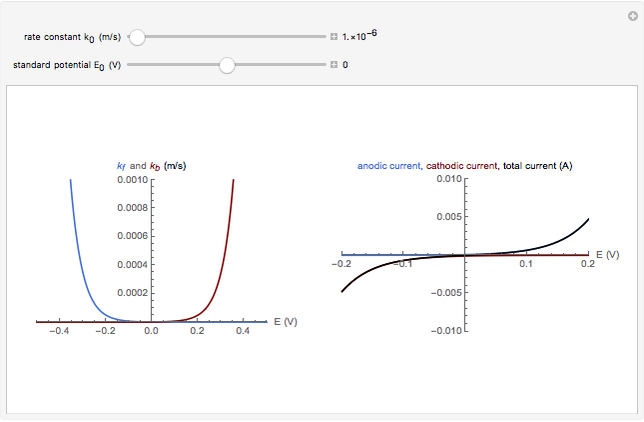 This Demonstration shows the dependence of the heterogeneous electrochemical rate on the potential as described by the Butler–Volmer equation. 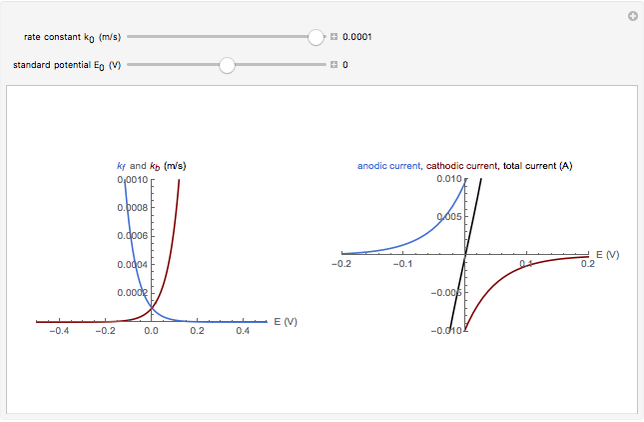 where (in V) is the standard potential of the redox reaction, (in V) is the applied potential, is the gas constant ( J/K mol), is the Faraday constant ( C/mol), (in K) is the temperature, is the number of electrons transferred, is the standard heterogeneous rate constant (in m/s), and is the transfer coefficient ( in this case). 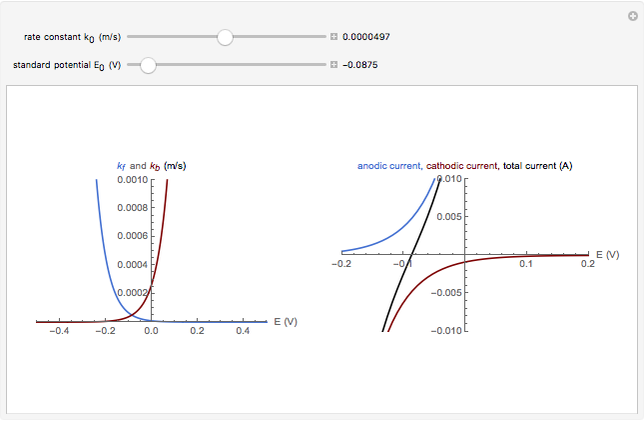 The net current at the electrode is the sum of the currents in the forward (cathodic current) and backward directions (anodic current). This is called the Butler–Volmer equation, the fundamental relationship between current and applied potential. This Demonstration shows that and change rapidly when the potential differs significantly from the standard potential . When the standard rate constant is very large, the current changes rapidly near the standard potential and the system is in a reversible state. When is small, the system is in an irreversible state. Quang-Dao Trinh "Butler-Volmer Equation for Electrochemical Reaction"